Lapland in winter is a magical experience - a scenic winter wonderland located deep inside the Arctic Circle and blanketed in snow from December to April. Inghams are able to offer an excellent range of Lapland holidays accommodation for all their guests to choose from, and equally importantly, wonderfully close relationships with all the key hoteliers, log cabin and activity providers in all three of their winter snow holiday resorts. As you will see upon arriving, during a winter wonderland holiday, reindeer far outnumber the people and the snow-laden trees form bizarre sculptures in the vast and silent landscape. At night you have a good chance of seeing the mesmerising northern lights shimmering in a star-studded sky. By day there are exhilarating reindeer, husky and snowmobile safaris as well as more unusual winter holiday activities such as ice fishing, ice carting and horse-riding. Choosing to spend the night in a thermal glass igloo or at the impressive Ice Hotel are on the bucket-list of activities for many of the guests - and not forgetting the downhill and cross-country skiing, of course. Treat yourself and your family to a magical break in Lapland, home to Father Christmas. Experience an abundance of arctic snow and the awe-inspiring Northern Lights that dance purple and green across the night sky. Inghams offer a choice of 3 nights or 4 nights stays in Levi and Ylläs, located just north of the Arctic Circle, where high standards of accommodation and a warm, friendly atmosphere make for a great stay in either resort. Meet Santa and his elves and help bake gingerbread in his workshop, hidden deep in the forest. On your last evening, you will indulge in a yummy traditional Christmas dinner with your family and friends. You'll also have the opportunity to experience reindeer sleigh rides or dash through enchanting snow-laden forests on a snowmobile or husky and reindeer safari. A glass igloo excursion is a must have experience on your Lapland holiday. Imagine falling asleep under the stars, with the Northern Lights dancing on the horizon. And when you wake, the low winter sun fills the morning sky with a deep blue light. Staying in a thermal glass igloo for a night is a truly unique experience only found in Lapland. The glass igloos are an incredible example of engineering, opening up the beauty and majesty of Lapland's night sky. Thanks to modern technology, we can finally enjoy the stars and the Northern Lights from the comfort of a warm bed, protected from the elements by a thermal glass dome. The glass is made of a special-make of thermal glass that keeps the inside of the igloo toasty even when the temperature outside drops to a chilly -30c. Inside the glass igloo there is a small living and sleeping space. The bed takes up the centre of the space and from here you can experience a stunning 360-degree view of the heavens and surrounding frozen landscape. All igloos include a WC, and The Golden Crown Igloos in Levi include a small shower room (discreetly hidden behind frosted glass) and a kitchenette. Inghams offer their guests in Levi or Saariselkä the opportunity to stay overnight in a glass igloo on a Glass Igloo Excursion. Transfers to and from your hotel are included, and your stay at the glass igloo will either include breakfast or breakfast and your evening meal. A Lapland holiday is not complete without at least one winter safari – and preferably all of them! 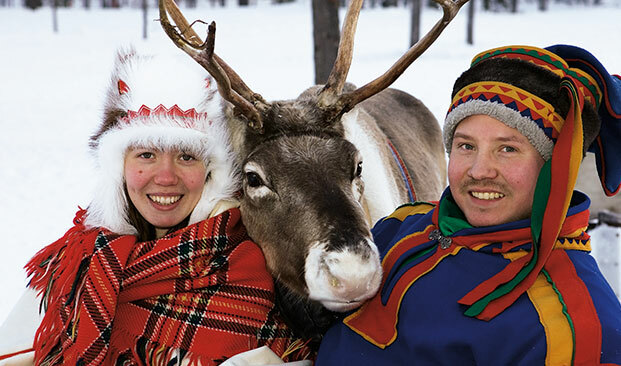 Inghams offer the chance to participate in each of the ‘Big 3’ safaris: reindeer, husky, and snowmobile. Reindeer are the traditional livelihood for the indigenous Sami community, and a Reindeer Safari and Farm Visit is a great insight into the soul of Lapland. Huskies are full of character, with their distinctive ice-blue or piercing, brown eyes and love of running, a Husky Safari is a wild and thrilling experience. The Snowmobile Safari might not have the romanticism of more traditional and natural safaris, but no other safari gets you further into the immense Lapland wilderness.